HEAD: I’ve never seen a non-Nitro beer with a head like this. It’s thick, white, impossibly tightly knit, and never really settles down. Looks just like Guinness. NOSE: Just a faint whiff of roasted malt and chocolate. This is as weak an aroma as I’ve ever found in a stout. Might as well be smelling it from 10 feet away. TASTE: The taste is as frustratingly subdued as the nose. Just a little roasted malt sweetness at the beginning and some burnt coffee grounds in the finish. Nothing else to speak of. MOUTHFEEL: Much thinner than I like for a stout. It’s well-carbonated, but very watery. DRINKABILITY: Neither the Prof nor I was particularly enamored with this brew. Weak nose. Insipid taste. Thin body. We certainly weren’t interested in another round of it. 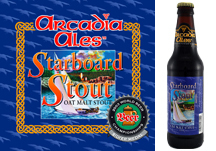 Posted in Tasting Notes.Tagged Ann Arbor, Arcadia, Ashley's, Oatmeal Stout, Starboard Stout. Previous Post YOU KNOW, FOR KIDS!